Ever since making banana bread waffles, I’ve wanted to try banana bread pancakes. We always seem to have a couple of bananas that are too ripe or just starting to get too ripe. So the other night (Yes, night. That’s when we have time to make breakfast food! ), I decided it was about time I give them a try. These pancakes are loaded with chunks of banana and lots of cinnamon and nutmeg. All of the banana makes these slightly denser than your average pancake, but the result is a pancake that tastes a lot like a warm, thick slice of banana bread. Using whole wheat flour and non-fat buttermilk makes these a healthy option for breakfast, lunch or dinner! 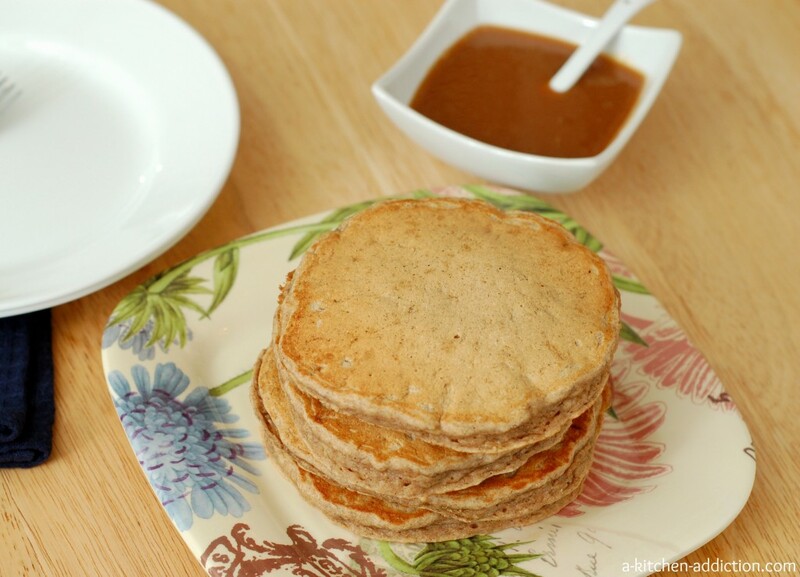 I knew right away that I wanted to top these pancakes with a simple peanut butter syrup. I already put peanut butter and a little syrup on my pancakes, so I figured I may as well mix them together with a little vanilla extract. So good! You may just find yourself pouring the syrup over more than just pancakes. . . In a large bowl, whisk together flours, sugar, baking powder, baking soda, cinnamon, nutmeg, and salt until well-combined. In a medium bowl, mash bananas. Add in milk, vanilla extract, and butter. Stir until blended. Bring a skillet or griddle to medium heat. Spray with non-stick cooking spray. Pour ⅓ cup of batter onto hot skillet. Using measuring cup, lightly spread out batter in a circular form. Cook until bubbles begin to appear on the surface, about 2-3 minutes and flip. Cook for another 1-2 minutes. Serve with peanut butter syrup. 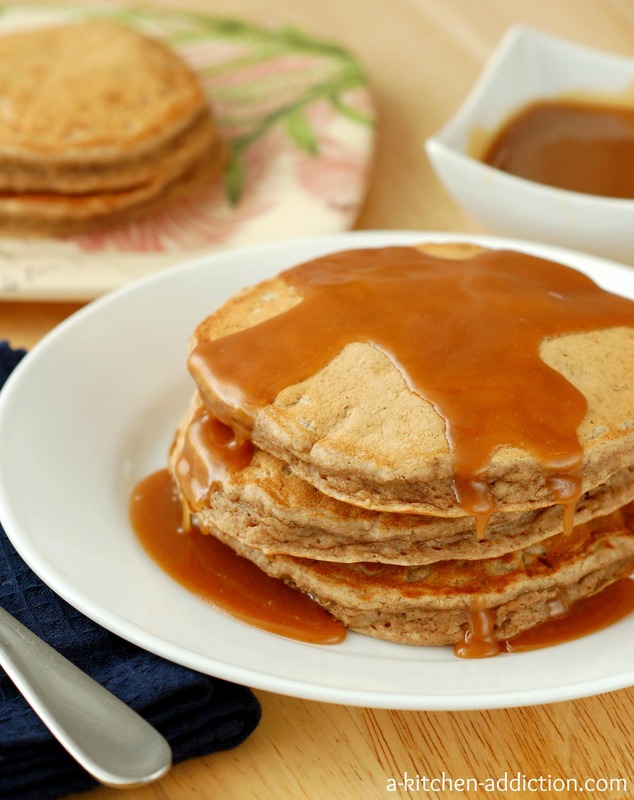 To make the Peanut Butter Syrup: In a microwave safe bowl, stir together maple syrup, peanut butter, and vanilla extract. Microwave for 30 seconds and then in 5-10 second intervals until mixture is warm, runny. This recipe is loosely adapted from How Sweet It Is and is linked with Strut Your Stuff Saturday, Time to Sparkle, Weekend Potluck, What’s Cookin’ Wednesday, What’s in Your Kitchen Wednesday. Chunks of bananas? Sold! Love the peanut butter syrup! Love peanut butter, love banana’s, love these!!! My word these look fantastic! Peanut butter syrup sounds wonderful! I want these every day. These look delicious Jessica, I love the combination of the banana with peanut butter syrup! Peanut butter syrup?! What a brillant idea! Holy shmoly! These look awesome and nothing is better than some peanut butter and banana! Peanut butter syrup?! You’re a genius! i just made your banana waffles this morning…next time these pancakes for sure…and that syrup oh goodness! Pb syrup may be the best sounding thing ever! When I make pancakes or waffles I always do it for dinner. There’s something so comforting about them! I bought too many bananas at the grocery store last week, so this is the perfect way to use them up! Peanut butter syrup??? I need some of that asap! I love banana bread anything, and these look to die for! I love these, Jessica! 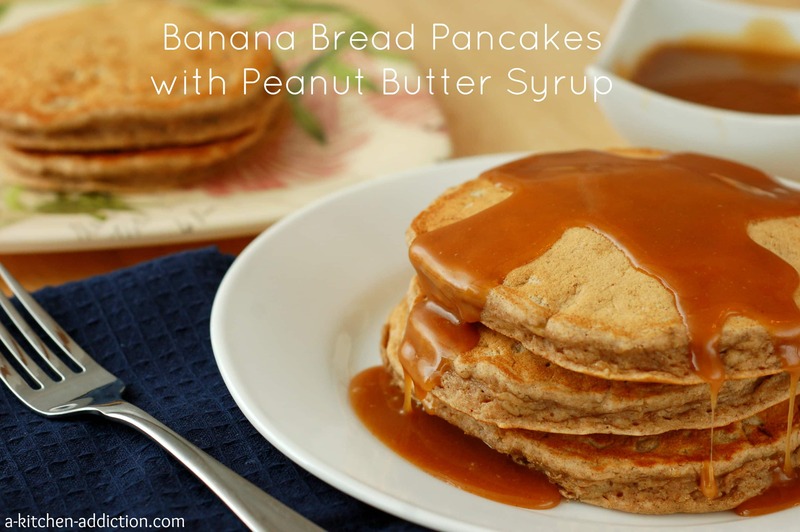 that peanut butter syrup sounds sooooooo good – perfect with some banana bread pancakes! awesome breakfast! I love that these have chunks of bananas in it. Sounds so delicious! Love this twist on banana bread, and that syrup… I’m drooling! My mom said when I was younger I refused to eat pancakes until she started putting the peanut butter syrup on them. My husband thinks I am totally weird every time I put it on them. Now I love all kinds of pancakes so I am definitely going to have to try this recipe!